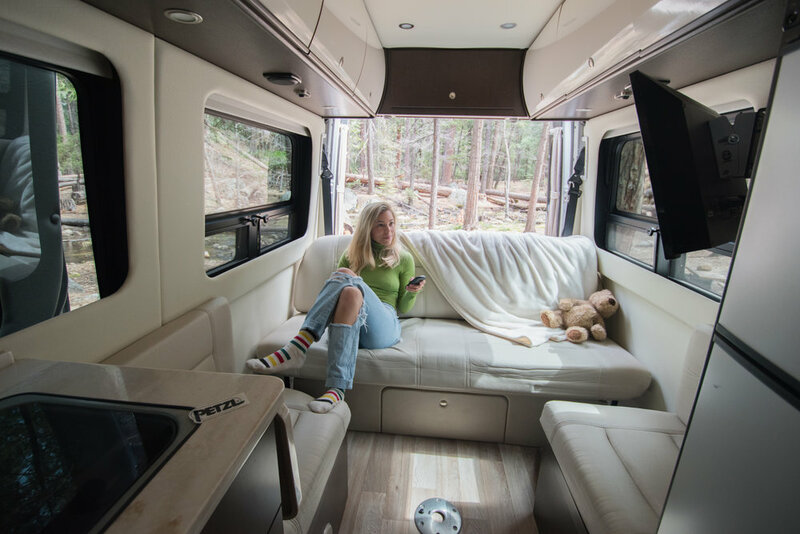 Luke and Willa are just back from a trip to Yosemite in the Sprinter van called Sparkles. When asked for feedback about their experience, Willa reported, "The van was too comfortable! Luke had to drag me out of it!" Ah, a good problem to have. Sparkles, a 2014 Mercedes-Benz Sprinter, is indeed very comfortable and a great fit for two people. The kitchen - with its refrigerator, microwave, oven and range - is fully stocked. The queen sized bed is super comfy and easily folds up into a seating area when you aren't sleeping. With a bathroom and shower inside the cab, you'll have immediate access to everything you need for a comfortable and relaxing experience. Which is why it is no wonder Willa wanted to spend so much time in the van. But when you are visiting Yosemite, you really should get out and explore. Follow these tips from the park service for making the most of your visit to Yosemite. And to reserve Sparkles, simply click here or the Reserve Now link above.